Jeff Karczynski leans over the bow of his Wenonah Boundary Waters to execute a wide figure-eight. The photographer was also standing. 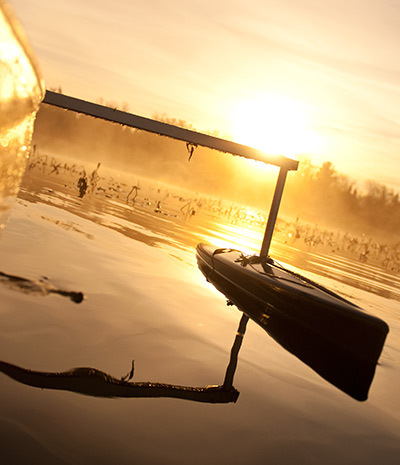 A solid canoe stabilization system turns America’s native watercraft into a serious fishing platform. By the looks of things, we have drifted quite a ways since our put-in in this series of watercraft reviews. Perhaps this is fitting. We began with a review of the hard-water lovin’ Stealthcraft Aftermath, a boat that shines within the parameters of the conventional driftboat. From there we moved on to the Adipose Skiff, a more compact, agile and shallower running ship for those anglers who fish quick flows but rarely if ever encounter white water. Next up was the Towee Skiff, a hybrid vessel of sorts that locomotes however you want or need it to (motor, oars, push pole, even paddle). And now, we set our sights on the humble but versatile canoe. More so than any other watercraft in this series, the canoe needs no introduction. It’s North America’s native vessel, and many of us likely had early fishing experiences in one. But one of the canoe’s essential features—a relative instability when compared with really any other watercraft—has left it off the list of the serious fly angler. Without an answer to this stability issue, I would probably leave it off this list, since a good many of us either prefer or need to fish standing up (sink tip streamer brethren, I’m looking at you). But I’m happy to report that we’ve found an answer to the stability issue: the Spring Creek Outfitters Hydrodynamic stabilizer. This, then, will be less a review of one particular canoe model than a species of watercraft. And less a review of this watercraft alone than the watercraft coupled with a particular stabilization system. First, let’s look at the Spring Creek Hydrodynamic stabilization system. Pontoon height can be easily adjusted according to how much freeboard you’ve got available. When you want to cruise, simply draw the pontoons up and lock them in place above the water. Or remove them completely and stow them in your canoe. 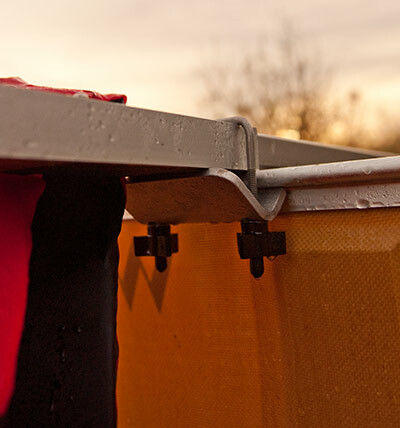 The complete system consists of two polyethylene molded floats that attach (and detach) quickly and easily to a receiver that straddles the gunwale of your canoe. It’s such a well-designed, simple and intuitive idea that the instructions were actually unnecessary—a very welcome redundancy. The stability afforded our canoe, a Wenonah Boundary Waters already designed for initial stability, was impressive. We spent the first hour or so testing its limits, and had a difficult time imagining any way to tip it. And we really did put it to the test, casting 11 weight rods, 450 grain sink tips and massive, massive streamers–flies you don’t so much “tie” as “build”. 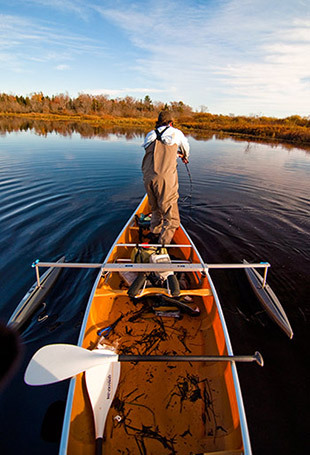 In any and all cases, whether leaning over the gunwales to figure-eight or fight a fish or heed the call of nature—any call of nature, if you get my drift—the HD Stabilizer rendered our canoe fishy and unflappable. The best part of all this was being able to hop in and out of the canoe (two anglers, same side) without a second thought to unhook and resuscitate large fish, in our case, muskellunge. That said, even with a stable platform, your ability to balance yourself is going to depend on the width of your casting area. The narrower your beam, the more you’re going to want to stand closer to the center of your watecraft. I fished from the front of the canoe for most of the trip, and definitely preferred casting from the sternside of my seat. 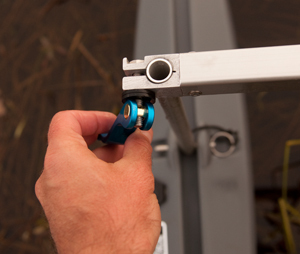 The receiver locks quickly and sturdily to the inner gunwale (if your canoe has a reverse gunwale, simply reverse the clamp). After testing and admiring its stability, we looked closely to see how the presence of the pontoons affected our mobility. This proved to be not much, thanks to the hydrodynamic design—each pontoon is shaped like a miniature canoe. Our original plan was to remove them for long paddles (which is terrifically easy to do), but their affect on our speed and turning ability was so slight that we just left them on. If you need to paddle 8 hours straight upriver, sure, take them off. But for shorter paddles, or for paddling mixed with fishing, there’s really no reason to remove them. Having vetted and averred the stabilization system, let’s take a look at the advantages of fly fishing from a canoe. The first and biggest advantage is mobility. Driftboats and skiffs can transport you downstream in style and comfort, but don’t ask them to take you up current (unless, of course, you’ve got a motor, which is a whole other story). Their weight, size, and shape all conspire to make that prohibitive. A canoe, on the other hand, holds its own in slow to moderate currents, whether traveling upstream or down. This freedom of mobility is particularly advantageous to the big fish hunter. Unlike lake anglers who can return to missed fish over the course of a day to work them over again, anglers on a typical 6-8 hour float typically get one chance at a fish and one chance only. The canoe angler, on the other hand, can return to spots to have a second or even third wack (providing, of course, that the current is manageable). This became invaluable on our musky trip where, naturally, fish were few and far between. It was our ability to return to known offenders later in the day with different or refined presentations that accounted for half the fish we put in the boat (in other words, two fish). Being able to paddle back to our put-in at the end of the trip also made it possible to use one vehicle and not rely on spotters (non-existent on our particular river system). Another advantage to the canoe is stealth. Canoes really allow you to sneak up on fish, particularly on the type of water they are best suited to–that is, slower water and lakes. Shallow water also isn’t a problem, since there’s really no such thing as running aground in a canoe. You’re never more than a hard push on the paddle from moving downstream or off the bank. For those looking to camp riverside or otherwise extend their trips, the canoe also offers tremendous capacity without compromising manueverability. They were, after all, designed to transport things: bodies, fur, food, you name it. There isn’t another watercraft that will allow you to carry food and gear for two weeks in the watery backcountry so harmoniously. Fishy stability and good looks to boot. Ease of use is another check in the pro-canoe column. One disadvantage of owning a driftboat or skiff is that, unless your fishing partners are pretty decent on the sticks, you’re either going to be doing a lot of rowing or suffering the slings and arrows of poor boat control (which can really put the damper on a streamer angler’s game). Canoes, on the other hand, are at once more familiar, easier to manipulate, and much more responsive. All this brings us to the last and perhaps greatest advantage of fly fishing from a canoe: you’ve got one. Or could get one. Cheap. Off Craiglist or your nephew or co-worker. So there she is: the canoe. A sea-worthy and now even fishing-worthy vessel ripe for the paddling. Depending the water you fish and your love of the J-stroike, maybe it’s time to add one to your fly fishing fleet.